Love is probably the most magical thing in the world. No words or deeds can ever fully comprehend or express this feeling. Many people have tried. Hundreds of thousands of songs and sonnets have been created, millions of blood and sweat have been shed –all in the name of love. 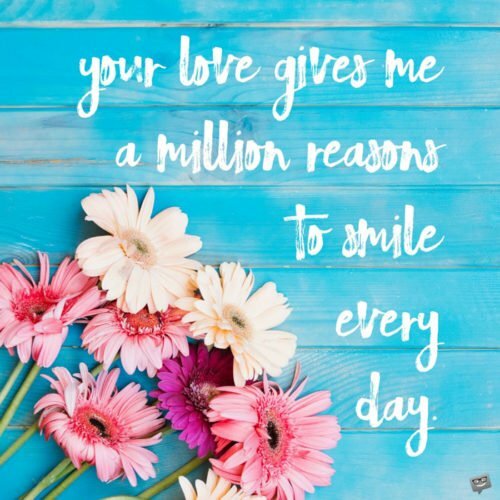 Maybe you have tried it yourself, but found it difficult to grasp this emotion you have for your significant other –your girlfriend, boyfriend, husband, wife, or partner. Maybe you haven’t tried because you are too overwhelmed and at a loss of words. Either way, one thing is for sure: people will never stop trying to express this feeling for their loved ones –that includes you! You just need to find the right words. Don’t worry, you don’t need to look for a long time. 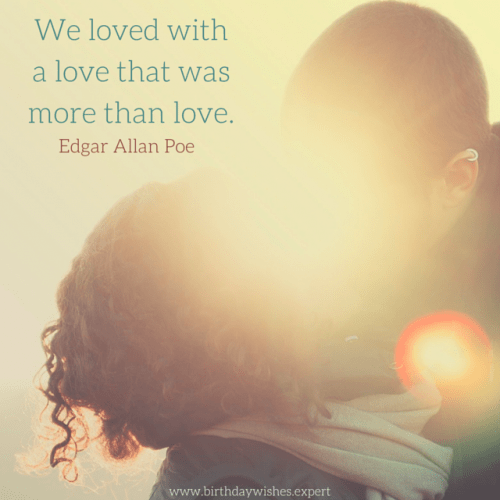 This article provides several quotes about love you can surely relate to! Choose below, and spread the love! Honey, you are sweeter than sugar. Will you continue to sweeten my life? I may not be perfect, but I promise you this: we are perfect together. Whenever I am with you, my heart goes doki doki and my mind goes wee. I love you, and forever true it will be. When I say I love you, it doesn’t only mean that I love you now, it also means I love your past that made you the you today, and your future you which is the result of the you today. In the end, it will always be you. I will always love you. 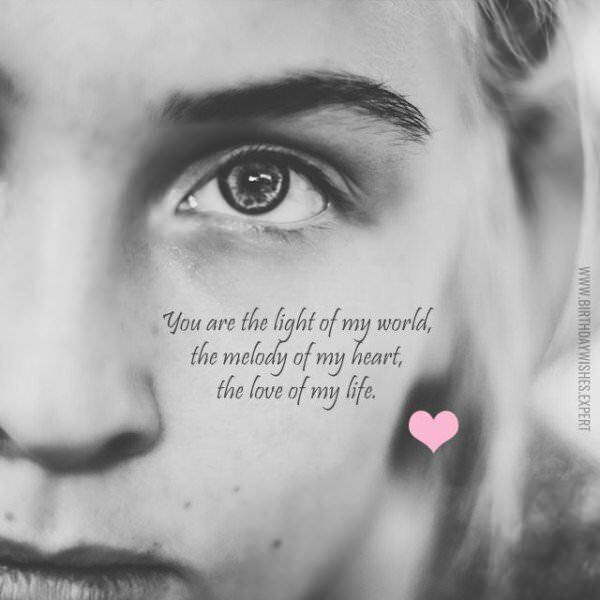 You are the light of my world, the melody of my heart, the love of my life. I bought hundreds of super glue. Can I stick myself with you? You should be called Aldo. Because Aldo anything to let you know how much I love you. You are my heart’s desire, the one I long for, day in, day out. Darling call me Al, because Al be the one to make you happy. Is your name New Year? Because I New Year the one! (I knew you’re the one). Are you an issue? Because all I want for Christmas issue! (All I want for Christmas is you). There’s no fear in loving you. There’s only hope. Hope that we’ll always be happy together forever. You are my daylight shooting star, my wish come true, my forever love. If you ever wonder where I am, look in the mirror. I’m there in your heart. Like you are to mine. You are the one I’m willing to die for just to defend. I will love you till the day I die. All the riches in the world will not be able to compare to the happiness I feel knowing you are here with me today. Everything you do makes me happy. You are the very source of my happiness. You are my happiness. I love you like I breathe air. I will die if I stop. 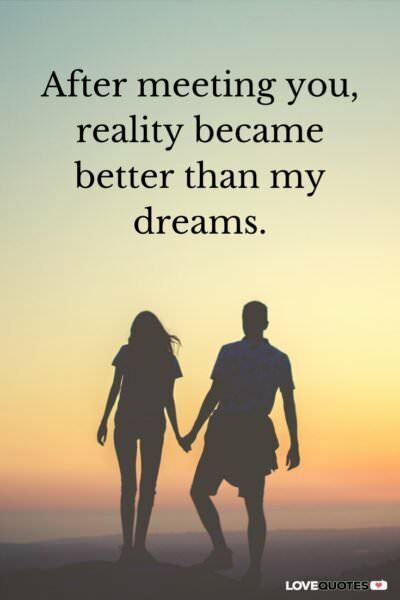 After meeting you, reality became better than my dreams. You brighten my darkest days and color my dullest moments. My life would be sad without you. Everything that happened in our life happened for this moment –for us to fall in love. I never knew love can be true until the day that I met you. I love you beyond words and reasons. I can’t explain, let alone comprehend this feeling that I have for you. My love for you transcends through time and space, through dreams and realities. I love you now, I love you forever. I don’t remember when I started loving nor how it even started. All I know is that it shall never end. If forever isn’t true, I want to be with you till the end of my days. 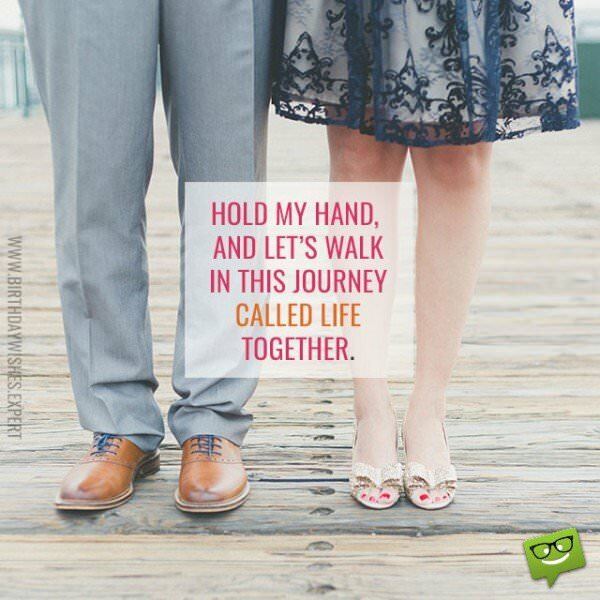 Hold my hand, and let’s walk in this journey called life together. You make me believe in myself every time doubts start to appear. You make me strive for excellence every time temptations for mediocrity emerge. You make me a better person every time, every day. You are not my world, you are just my favorite part. You are the one I never want to let go. You are the one I love. By trusting you, I learned to trust myself. By caring for you, I learned to take care of myself. By loving you, I learned how to love myself. The universe must be generous. It gave us a chance to meet and fall in love. Many have argued whether forever is true or not. How about we discover the truth of it together? I do everything extraordinarily well for you because I love you. I am here to love you even if the world starts to hate you. Beside you, I will stand. For the rest of my days, for all my life. In my heart, you shall stay forever. In my mind, you shall leave never. No one can even compare to your intelligence, skills, and beauty. No one can ever compare to the love I have for you. I would write songs and sonnets of your love if I could. Believe me, I would if I could, but I can’t. I do not have the skills. But I will love you in the best way I can. You came into my life so suddenly. I fell in love so magically. I will love you so exquisitely. I may not have a hold of time, nor have control of how life may turn out in the future, but I know for sure it will always be you that I love. I love in the best possible way I can, for the best possible reason I have, the best possible person for me. In this ever changing world, one thing remains the same –my love for you is still as tender and passionate as before, and it shall never change. I never believed in love at first sight, till I saw you the very first time. You came in the right time, in the best way, in my imperfect life.